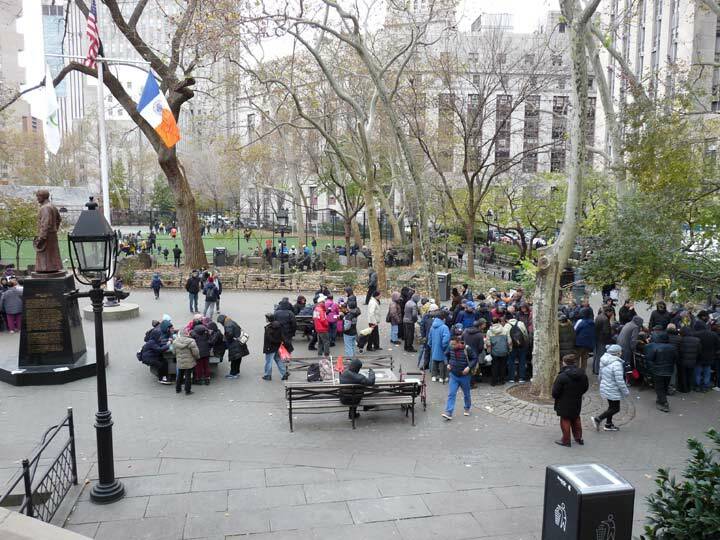 When “Charlotte Street” is mentioned, anyone in NYC over age 40 can remember the two words with dread, remembering the dead landscape full of burned, crumbling buildings visited by President Jimmy Carter in 1977, and Republican candidate Ronald Reagan in the fall of 1980. Arson (some of it perpetrated by landlords and owners), crime, drugs and abandonment by the city during the fiscal crisis of the 1970s had conspired to turn it into ruin. Thirty years have made a difference: Charlotte Street in Crotona Park, the Bronx, is now lined along its two-block length with ranch homes priced at between $500K and $1M. 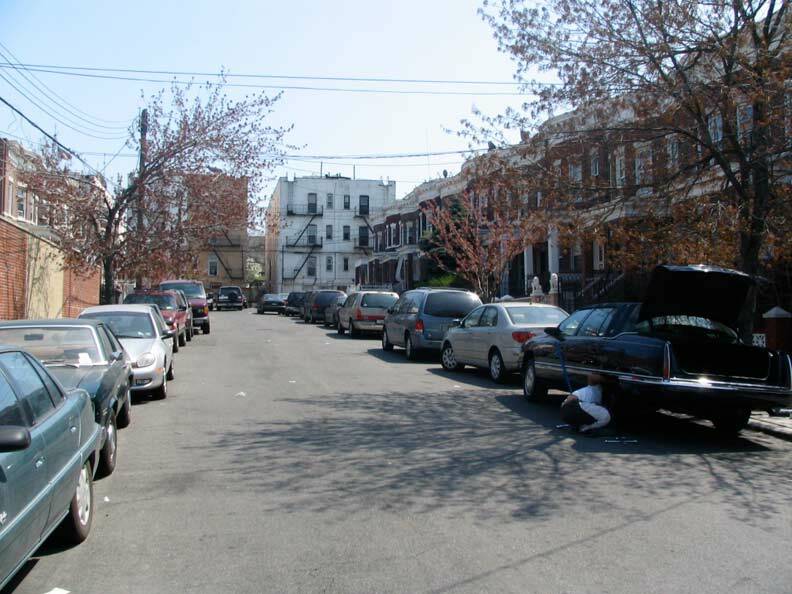 Today we’re going to visit NYC’s “other” Charlotte Street — a one-block cul-de-sac hidden amidst the auto parts shops of Ridgewood’s Flushing Avenue. 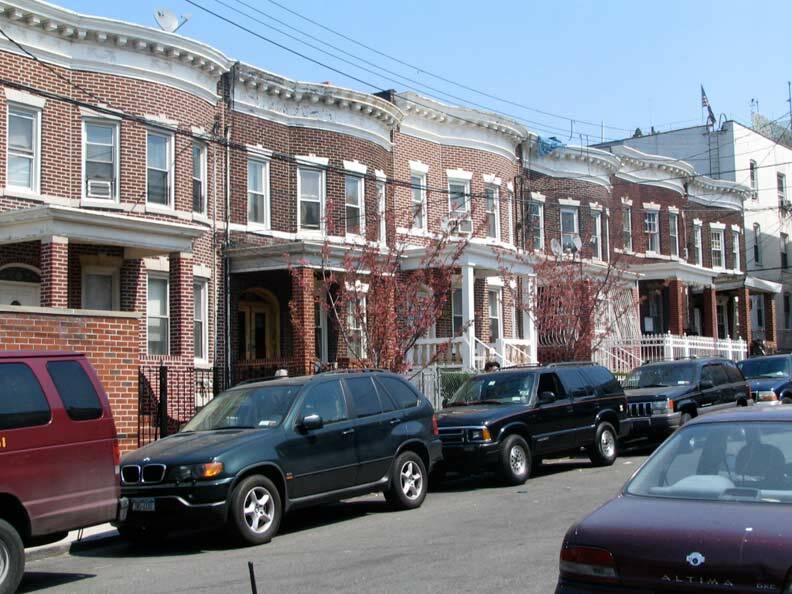 Charlotte Street, lined on both sides with pleasant attached brick buildings, is a complete contrast to heavily-industrialized Flushing Avenue. The buildings are nearly identical, with bowed fronts and nifty porches at the front entrances. LEFT: This 1929 Belcher-Hyde atlas shows Charlotte Street already in place. 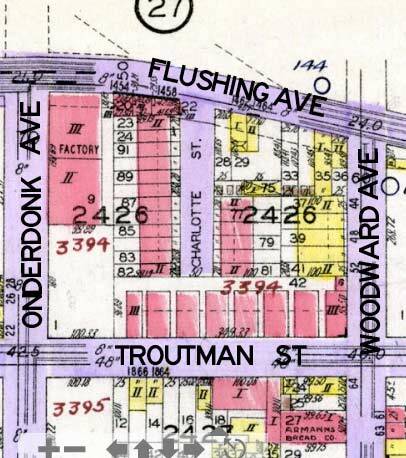 At the time Flushing Avenue was lined with Dutch farmhouses and the road, which not long before 1929 was called the Brooklyn-Newtown Turnpike, had a suburban if not rural air. 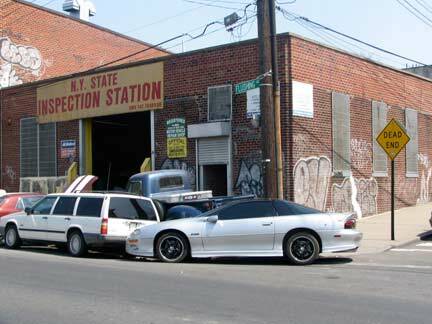 By 2006 Flushing Avenue was likely the worse-maintained major avenue in NYC, with potholes and exposed long-unused trolley tracks playing havoc with axles. It has since been repaved. Note the 1462 and 1464 house numbers just below “Flushing Ave.” The avenue has since been renumbered and the buildings along the avenue now carry 18- Queens prefixes, as in 18-02, 18-04 etc. House numbering in this part of town is weird–the Brooklyn-Queens line runs along Cypress Avenue, and Bleecker Street, for example, carries house numbers in the 700s on the Brooklyn side, and after crossing Cypress Ave. into Queens, shifts to 17-01, 17-02 etc. After reaching Forest Avenue, though, it makes another jump to 59-01, 59-02 and so forth. 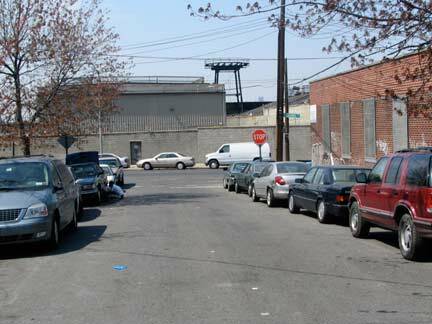 In general, in Ridgewood, Queens, west of Forest Avenue, the street numbering behaves as if the overall Queens street numbering system didn’t exist, but it isn’t a part of Brooklyn’s either; it’s in limbo between the two. East of Forest Avenue, the normal street numbering, in the 60s, resumes, and house numbers comply. 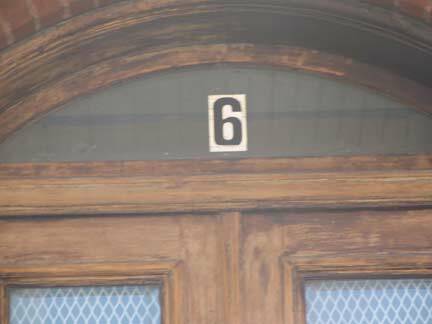 And speaking of house numbering, Charlotte Street, like some alleys and dead-ends in Queens, tosses out the borough’s strange, hyphenated house numbering system entirely: it is numbered in single digits, even numbers on the left, odds on the right. Until a couple of years ago, Charlotte St. was paved with rare red bricks; these were asphalted over as part of the relentless standardization the Department of Transportation perpetrates on unprotected or unlandmarked streets. At a NYS inspection station on Flushing and Charlotte I found an ancient Chevy truck. What year, Name That Car fans? 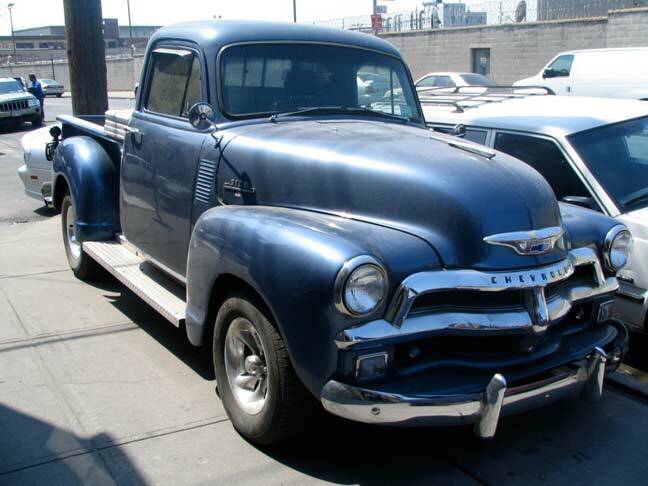 ForgottenFan Jon Abels: The pickup is a 54 Chevy…..probably a model 3100 given the front bumper guards. It’s notable for the distinctive grill and one-piece windshield and this model represented the last year of this body style before the radical change in 1955…the model remains very popular with custom/chop shops but I am always pleased to see an unmolested collector in decent shape. 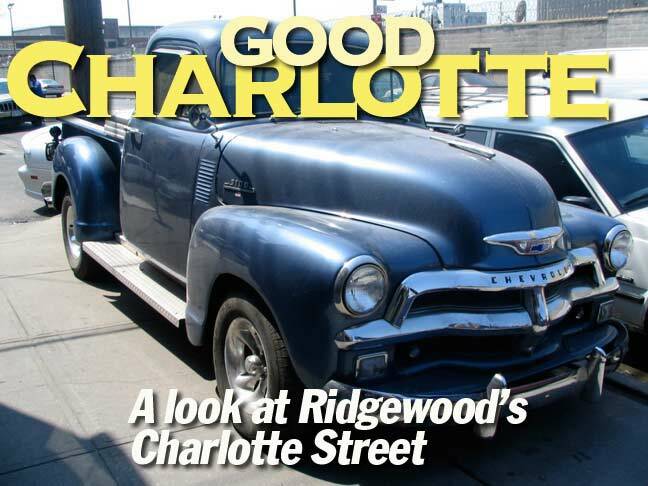 ForgottenFan Brian Deck: The Chevrolet truck on the Good Charlotte page is a 1954 model year. The 1954 Chevrolet and GMC trucks are easy to identify because it is the only year of the 1949-1954 style to have a one piece curved windshield. The 1949-1953 years had a windshield made with two pieces of flat glass, joined in the middle, making the windshield V shaped.